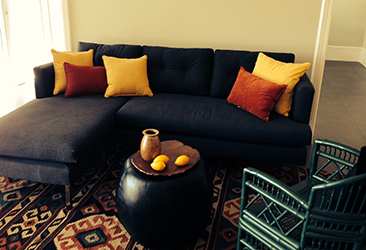 Existing: A black sofa from West Elm, a black leather ottoman and a round glass table with 4 black wire chairs. That was all!! 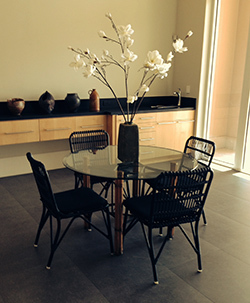 The space was gray slate, black granite and blonde 50’s modern wood. Everything oversized Tall ceilings, wall to wall glass doors. I’m taking you through the process to demonstrate how you can think through your own rooms. I chose one color – bright yellow for accent pillows 18” square – $20. Each on sale Pier I Imports. A second color, burnt orange for two smaller rectangular pillows to “cut” the bright yellow color. The homeowner had a good size kilim rug which provided pattern ad color – the only pattern in the apartment so we could use solid pillows. They added punch and a bit of drama to the sofa. The rug defines the seating area in the vast open living space. She also had a dark green rattan/bamboo barrel chair that we used to fill in the seating area and make a grouping.. If I had time I would have spray painted the chair black, but we were on a money and time crunch. I used the ottoman as a coffee table and put a handmade oversized platter on top, then a handmade clay vase for a little height. Since the homeowner is a potter I gathered all her oversized pots, plates, vases and used them a accents wherever there was an expanse of blank space. They add interest and character everywhere. 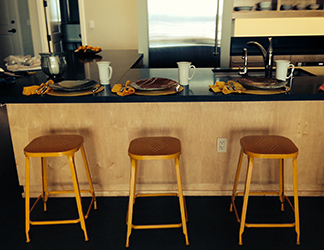 I bought 4 yellow, metal, rather industrial- looking stools from Pier I Imports to place in front of the long granite expanse of counter space in the open kitchen. This ties in the yellow color in the open seating area . The stools cost $89. apiece on sale. Since the glass dining table was on the small size for the space, I used a tall clay vase to hold very tall stems of white flowers to pick up the white of the coffee mugs on the counter. These branches allow light to come through but make a statement. If it were a real home I was staging I would hang oversized paintings on the wall expanse but the homeowner didn’t want to put nails in the walls. So, I filled the shelf along the width of the room with the homeowners pottery to suggest using a collection for artwork. Tip: Make an arrangement of a collection rather than spreading pieces all around a room. Way more impact! 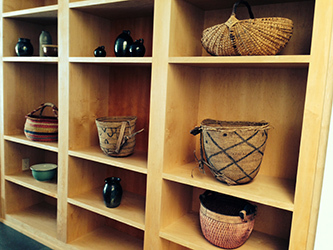 One wall opposite the kitchen was oversized built0in shelving which I filled with large interesting baskets that also came from the homeowners collection. In early Nantucket homes we often deal with small rooms. But, the new houses seem to have more spacious rooms. When adding accessories scale is important. Make sure you choose these items and artwork to work within the size of the rooms. It’s a matter of trial and error.